Your Chance To Win A Black Rhodium Stream Power Cable Worth �450. 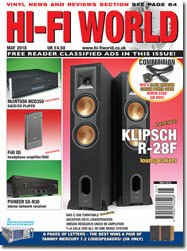 Jon Myles is impressed by a big floorstander from Klipsch. A modern small standmounter gets Jon Myles' ear. FiiO's latest headphone amplifier / DAC has the ability to extract better sound from your portable digital device, finds Jon Myles. McIntosh's new SACD / CD player brings exceptional quality from silver discs, says noel Keywood. Martin pipe enjoys the sound and power of Pioneer's new network receiver. The latest all-in-one streamer / CD player/amplifier from Germany's T+A is a star performer, says Jon Myles. Combining valves and solid-state makes for a powerful combination, finds martin pipe. Jon Myles tries out Tellurium Q's latest USB cable and loves its expansive sound. 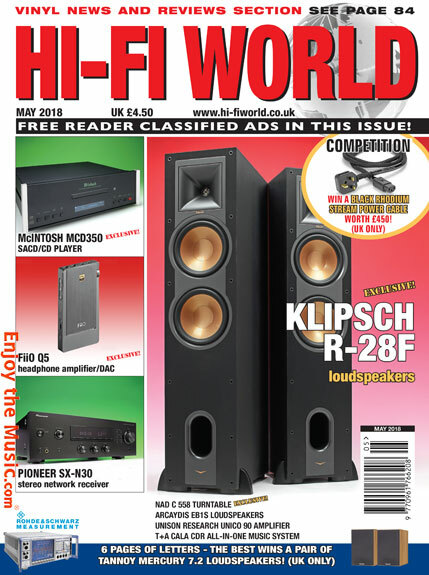 Noel Keywood reports on all the latest products from Bristol's Sound & Vision show 2018. Our 2017 award winners presentation at the Sound & Vision show 2018, Bristol. Martin Pipe looks back at pioneer's classic F91 tuner. Noel Keywood checks out NAD's latest budget turntable. Paul Rigby enjoys a new book charting the history of the famous vertigo label. Paul Rigby On Lee Dorsey's Yes We Can.